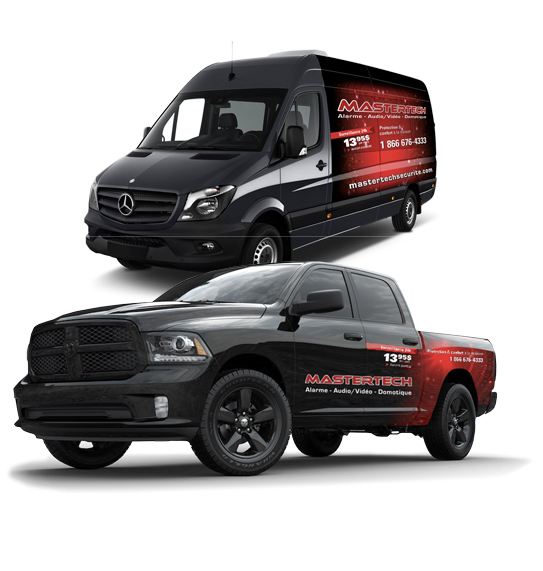 Vehicle wrapping is a marketing communication strategy that requires a thorough command of computer graphics, photography, printing, cutting, and installation processes. Our team has all the necessary expertise to design printed stickers that will elegantly decorate your vehicles. With our outstanding vehicle wraps, you can hit the road with pride! With over 30 years experience in design and advertising, our specialists are highly effective when it comes to unique layout of advertising content on the various surfaces of your vehicles. We are acutely aware of any innovations on the market as well as a few professional tricks. We have extensive knowledge on the image quality required for the various printing formats as well as expertise in materials and installation. From digital printing to installation, including the cutting of laminated or vinyl products, we know all the secrets to designing and developing the best wraps for your cars, trucks, vans, and trailers. Thanks to a successful partnership between graphic design and eye-catching messages, we are able to create ads that will set you apart and boost your business. The little details that make the difference... In order to offer our customers a fuller range of services, we take care of the little details that have an impact on your experience AND your results. With its multidisciplinary team of seasoned professionals at its disposal, Energik can create eye-catching content in no time. There is no container without content. Content is the very essence of your message. It states your business. It describes your products. In advertisements, content is the focal point on which concepts are based and variations developed. Content is paramount. It must be accurate, perfectly adapted, original, catchy, generate interest, and be somewhat unexpected. It must be perfect. Optimized content creation (optimized development, great images and photographs, etc.) is an art that must be mastered and only comes with years of experience. The content must not only reflect your intention; it must also be carefully written, have no faults or errors, be created with the right tools, and enhanced with that all-important finishing touch that can make all the difference. You must choose the right words, the right tone, powerful images, and highlight major points, thereby inciting visitors to read further and find out more. Web development - a technique carefully mastered by Energik. Website content must be developed with internet users in mind, i.e. written in a way that attracts them quickly and effectively to the message. The message must be CLEAR. You must also use clever keywords and specific web logic so that you can be recognized by Google, Yahoo, Bing, or any other search engine. To be effective, the titles and sub-titles should be catchy, original, composed with cleverly chosen keywords, and include a certain number of characters. A good command of the many web elements and techniques is therefore essential when developing website content. We have an eye for tracking down the best possible pictures. Our superior quality stock photos allow us to offer maximum resolution and royalty-free photographs that perfectly complement your visual content needs. We have millions of high-quality pictures at your disposal - eloquent and relevant photos, powerful images, technical illustrations, and product photos. All our photos are calibrated for printing, regardless of the method used, including digital and conventional printing and the web. We also offer personalized photography services, either on site or in the studio, as well as calibrations, retouching, and other visual effects that may be required. To learn more, contact one of our Energik advisors. Everything you need for effective communication! The Energik team also includes a network of experienced translators with an excellent command of several languages and the certifications required to practice their profession according to established standards. No matter what business or industry you are in, you can rest assured that our professional translators will deliver top-quality translations for all your bilingual communications. To create a good impression, your communications must be flawless and not contain any errors. With a view to maintaining a consistent level of quality, Energik offers all its clients proofreading and editing services. We at Energik believe that effective communications must be faultless and formulated according to the language policy in force in Quebec. We therefore systematically proofread and edit the content of all written documentation. In so doing, we ensure that all your communications are of the highest caliber and adequately reflect the quality of YOUR IMAGE and YOUR BUSINESS. Why choose us for your print management needs? The answer is "for peace of mind and the best prices". Our team handles all your print management needs and makes sure you get perfect quality every time. We also guarantee you get the best possible prices and unsurpassed service. You can put your full trust in us! Energik handles your book publishing projects from start to finish, offering complete design, layout, calibration, and print management services. Whether large or small, your book publishing project will be carried out with precision and attention to quality, ensuring that the finished product will meet or even exceed your expectations.Our team is composed of experts who specialize in every stage of the process. Contact our printing consultants to learn about our turnkey book publishing solutions.